You can only see this artwork when the water level of Utah’s Great Salt Lake is below average levels. When artist Robert Smithson was looking for a location to create his latest earthwork in the late 1960s, he hoped to find a place with red water. He came upon Rozel Point, a remote area in the north arm of Utah’s Great Salt Lake that blooms in pinks and oranges, thanks to an ever-fluctuating community of microbes in the salty waters. It was there he would build his monumental piece, the 1,500-foot-long, 15-foot-wide Spiral Jetty, in 1970. Land art was a growing trend among his peers at the time, and Smithson had long been interested in geology, science, and the transformative effects of nature. “This site was a rotary that enclosed itself in an immense roundness. From that gyrating space emerged the possibility of the Spiral Jetty,” Smithson would recall in an essay. 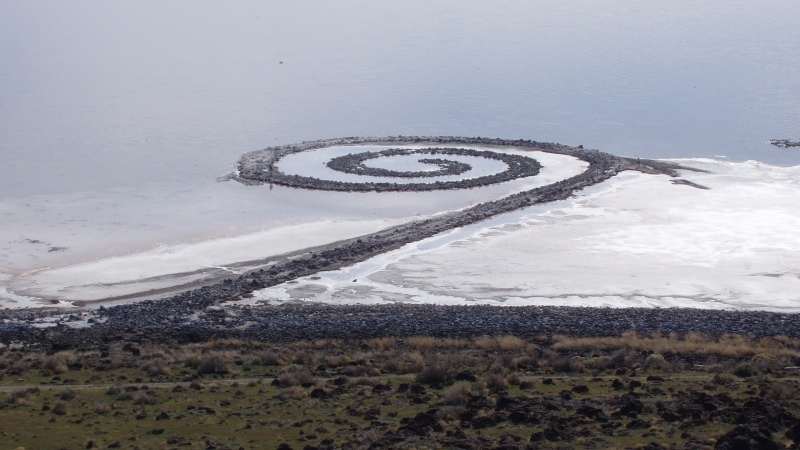 “He worked with a local construction team to mine the basalt out of the hills and make this spiral,” says Bonnie K. Baxter, director of the Great Salt Lake Institute at Westminster College, in Salt Lake City, Utah. “There was a period in history when that part of Utah was volcanic,” and basalt forms from lava. Smithson used more than 6,000 tons of black basalt and earth to create his counterclockwise spiral. Great Salt Lake is known as a terminal basin, meaning its water has no outlet. “Water escapes through evaporation, and everything else stays there,” says Jaimi Butler, coordinator of the Great Salt Lake Institute. At the time the sculpture was built, the water level of the lake was particularly low. But by 1972, the water rose again to near-average levels, submerging the artwork. “Smithson anticipated that the lake would rise and fall, the residue of salt crystals causing the black rocks to glisten white whenever the water level dropped,” the New York Times Magazine wrote in 2002. At present, the Spiral Jetty is still visible. “Right now, the shorelines are very depressed,” says Butler. Water diversion along its tributaries is partly responsible, and Baxter says that the surrounding watershed has undergone drought conditions for nearly a decade. “You can see the jetty when the surface elevation of Great Salt Lake is at about 4,195 feet above sea level. The historic average [of the lake] is 4,200 feet,” Butler says. According to the U.S. Geological Survey, the lake currently sits at 4191.5 feet. 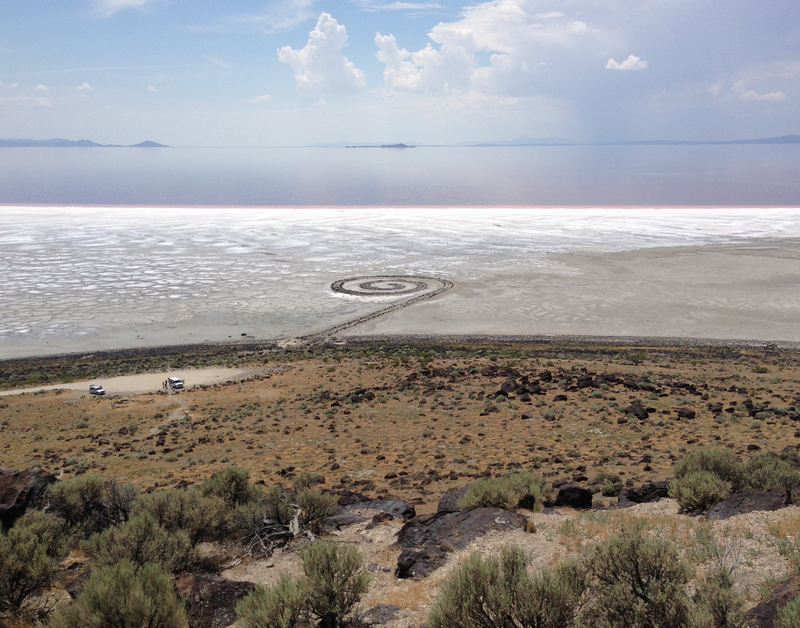 “The level of the water is always indicated to me by the Spiral Jetty,” Baxter says. Great Salt Lake is famous for its high salinity, which reaches up to 30 percent in some parts. The north arm is also abundant in colorful microbes. In particular, it’s home to salt-tolerant and salt-thriving organisms called halophiles whose cell membranes contain carotenoid pigments, the same pigments that give color to fall leaves or sweet potatoes. “It depends on the microbial community, but the combined pigmentation of that community at any given time will be slightly different,” Baxter says. Baxter and the Great Salt Lake Institute are interested in investigating whether the lake’s microbes can digest hydrocarbon coming in from oil seeps, and further, whether they might be useful in cleaning up oil wells in other cases. The Institute is also collaborating with NASA’s Mars Science Laboratory to research how long salt or gypsum crystals in the lake might be able to store biological molecules like cellulose or DNA, because that might help inform future biological work on the Red Planet. For example, if at some point there were water or life on Mars, “maybe it left some tracer molecules behind,” Baxter says. Parts of the giant lake are 10 times saltier than the ocean—but life has found a way to thrive.